Knaresborough Town dropped points at Manse Lane for the first time in 2017/18 when a late equaliser saw Hallam escape back to Sheffield with a 2-2 draw. 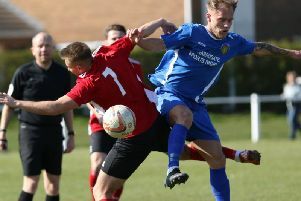 The NCEL Division One leaders looked to be on their way to a 15th win in 17 league games as they took a 2-1 advantage into the closing stages, however Gregg Anderson’s 86th-minute own goal meant that the visitors took a share of the spoils. Boro went ahead in the eighth minute when Ben Cohen was initially denied by a save from Hallam goalkeeper Andrew Sneath, but gathered the ball and shot again for Brad Walker to make sure from close range. Will Lenehan then headed wide and Rob Youhill also shot off target before Blaine Hobson’s strike was saved by Sneath. Another Lenehan header was cleared from the line, but the referee also blew for a free-kick and Greg Kidd saw a shot saved soon afterwards. Hallam’s Tom Roebuck ended the half with a header over the bar to remind Knaresborough that playing into a strong wind in the second period would be far from comfortable. Within three minutes of the resumption, the ever-dangerous Chris Wood won the visitors a penalty and Mitchell Dunne stepped up to convert from the spot, registering the first league goal Paul Stansfield’s men had conceded since September 2. Andrew Fox then fired over for Hallam before, at the other end, Steve Bromley shot too high from close range following a great run and cross from Youhill. Walker then cleared the crossbar with an effort while Boro gloveman Dan Atkinson was called upon to make a great save to keep out another shot from Fox. The hosts re-took the lead when Youhill set off on another fine run before playing the ball through for Walker to outsprint the defence, round Sneath and place the ball home in the 74th minute. Pressure then came from Hallam who won several corners which were seen off, but when a cross was played back across goal from the left, centre-half Anderson deflected a looping ball beyond his own keeper to provide Hallam with an equaliser. The result means that Boro’s lead at the top of the table has been trimmed to eight points, however they still hold a game in hand over second-placed Yorkshire Amateur. Next up for Stansfield and his charges is a tricky-looking trip to sixth-placed Eccleshill United on Saturday, 3pm kick-off.